ATEI is fast approaching and with we’re beginning to see announcements of what to expect at the show. If Sega’s press release is any indication, this show is going to be huge and fortunately we’re going to have coverage straight from the show so stay tuned to the site around ATEI time. SEGA Amusements Europe put the “X” into Exhibition! SEGA AMUSEMENTS EUROPE LTD has yet again positioned themselves to be the main focus of attention at ATEI 2008. The industry colossus has a blatant show of exhibitionism with a stand bigger brighter bolder and sexier than every before. SEGA’S product line up at ATEI 08 is full of new product and new services compounding Sega reputation as the driving force for the global amusement industry. Pride of place at the ATEI will go to SEGA’S UFO CATCHER. Shock waves have ripped through the industry after amazing income figures from SEGA UFO CATCHER testing sites hit the press. The new found champion of the crane business certainly has tongues wagging. The “SEGA UFO CATCHER EXPERIENCE” will be a prominent part of the Sega Stand at the ATEI. On display will be offerings from SEGA’S newest and brightest division “SEGA PRIZE EUROPE”. Set up as a dedicated support operation for the smash success SEGA UFO CATCHER. SEGA PRIZE EUROPE will provide a wide variety of product and merchandise that complements the unique capability of the SEGA UFO CATCHER to utilise “boxed” products. A sneak preview of SEGA PRIZE EUROPE merchandise will be on display at the ATEI – including SEGA BRANDED LICENCED PRODUCTS. SHOOT THIS WIN THIS – the fast paced carnival style, prize vending, shooting game – with its FINAL VERSION SOFTWARE is a welcome addition to the market place putting a sure-fire, “bang” into cash boxes everywhere! 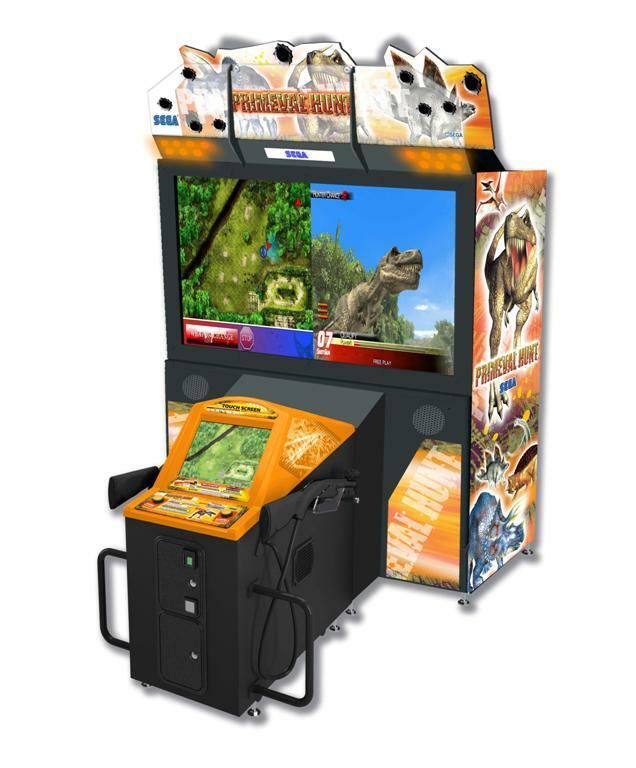 A classic in the making is PRIMEVAL HUNT the prehistoric 1 or 2 player dinosaur hunting game features touch screen technology, 62” screen, pump action guns and free roaming game play – the machine is on general release from Feb 08. The brightest driver on the block SEGA RACE TV will be present at ATEI in all its glory. The American style driver certainly turned some heads at the London Preview with its fast all action fun playing style. SEGA RACE TV has multiple game play features guaranteed to have players racing for the starting line – including 4 car link-play – road traps and licensed cars that show road beating disintegration in real time – a joy to behold. Sole distribution rights for the All-New MINI RIDER 2 have gone to SEGA AMUSEMENTS EUROPE. The market leaders are eager to show off this piece at the ATEI for its EUROPEAN DEBUT. This impressive two seater motion based simulator benefits from 4 thrilling rides, 4D wind effects, and a PATENTED INVERTED MOTION SYSTEM. Earmarked as the MUST HAVE piece for 2008 the MINI RIDER II creates an amazing centre piece attraction for any location. Totally COIN OPERATED the MINI RIDER II negates the need for an operator making it twice as appealing. To add to the breadth of product on display Sega are to show SEA WOLF – this submarine sea battling game of timing and skill is a redemption piece of Atlantic proportions. Orders for SEA WOLF will be taken at the show for all SEGA territories except the UK and Italy. SEGA TOTAL SOLUTIONS – (STS) – the dedicated spares division will also be on hand at the show to speak directly with clients both old and new – after a very successful first years trading, STS will have a lot to shout about including a display of spares product. Finally, SEGA AMUSEMENTS EUROPE LTD – are to disclose a ground breaking revelation in early 2008 – watch industry press and SEGA website for information. You can enjoy the complete SEGA AMUSEMENTS EUROPE LTD product experience on the upper mezzanine of the Earls Court Exhibition centre. Other products on show at the ATEI in January will be GHOST SQUAD EVO, PIN AIR, LET ME DANCE and the OUTRUN 2 attraction. I am happy to work with you in the field of entertainment projects in Saudi Arabia and the Gulf – where I work in entertainment since 1993. I have a client who wants to include recreational game on a real car in front of a large screen- 4D limited ) full effects of the Movement of the car – the client wants to buy 3 cars to park in Jeddah, ( indoor )K.S.A . I have a client who wants to include recreational game on a real car in front of a large screen- 4D Limited ) full effects of the Movement of the car – the client wants to buy 3 cars to park in Jeddah, indoor.